Parker Gallant exposes the impact of municipalities usage of LDC's -- as with most things these days, that impact is higher electricity costs. "Toronto Hydro-Electric isn’t the only local distribution company (LDC) that is seeking increases as Hydro Ottawa also has sought significant rate increases for similar reasons. Hydro Ottawa also has paid out 60% of their after PIL profits to their shareholder, the City of Ottawa whose council endorsed the payment of 60% or more of Hydro Ottawa’s earnings be paid to them; and over the past 6 years dividends paid were $104.8 million." This article from the Ottawa Citizen is another example of a local distribution company seeking rate increase, but the big news is the Ontario Energy Board told them to control their expenses instead. "Alta Vista Councillor Peter Hume, who sits on the holding-company board, said that in a way, the board's ruling speaks well of the company's management, which has turned more money than expected over to the city, as its sole shareholder, than had been projected over the last several years. "The OEB has said hey, you're doing such a great job at managing against revenue expectations, you can take some of that from your rates," he said." "South Korea has reiterated its commitment to increase its share of nuclear power. "There is no change in the government's nuclear energy policy," Yonhap News quoted Hong Suk-woo, South Korea's minister of Knowledge Economy, the government arm in charge of the country's energy affairs, as saying. "The government will continue to construct nuclear power plants." Hong's comments came after the government's announcement last week of two proposed sites for nuclear power plants: Yeongdeok in North Gyeongsang province and Samcheok in Gangwon province, both about 190 miles from Seoul." "Wyoming next month will begin imposing a $1 per megawatt hour tax on wind energy production. The state sales and use tax exemption on equipment used on wind energy projects also expires in January. The sales and use tax rate varies by county but generally exceeds 5 percent. That tax promises to add up, considering that a typical 1.5-megawatt wind turbine costs up to $3 million and a typical wind farm has about 66 turbines. The Legislature's Joint Revenue Interim Committee in October shot down Mead's proposal to continue the tax exemption for wind energy projects while imposing a 2 percent impact fee on wind projects to support county governments." Meanwhile, in Ontario, the Electricity Act is being redone, under the lie that it is related to accountability after the Auditor General's calling out the contemptuous Minister of Finance on obfuscating on the amount of the Residual Stranded Debt (the legislation thinks the Lieutenant Governor would have a far better idea of financial matters than the Minister of Finance - which is, admittedly, almost certainly correct at the current time). Section 92 of the new act deals with what happens to the 'payments in lieu' of taxes (PIL) after the Stranded Debt is retired (unlikely to ever occur as the government, cheered on by the NDP, is strangling the price paid the pubic generator in order to subsidize private operator friends gifted with contracts). Most will revert to being taxes paid to municipalities, with a notable exception: wind. An article from the famed Iron Ridge shows the rugged there aren't falling for the normal nonsense! Pity Ontario's north voted for socialism only to get Greenpeacism, devoid of results or honesty. "The Lakefield developer, EnXco, has not disclosed the cost of its ratepayer- and taxpayer-subsidized project, but similar developments are in the $400 million to $500 million range. EnXco, owned by the French, expects to receive 30 percent of the project’s total cost upfront from the U.S. Department of Energy. The Midwest System Operator grid actually will receive the power for transmission to Indiana. Midwest System Operator or Indianapolis Power and Light will need additional backup power, probably from a natural-gas plant, to supply Indianapolis Power and Light when the Lakefield wind farm isn’t producing. 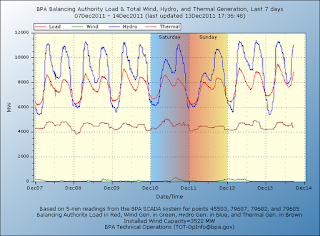 Intermittent-energy wind farms everywhere have created demand for new natural-gas “peaker” plants. These plants are kept in spinning reserve to respond rapidly during the 75 percent of the time when the wind is too light or too strong for the wind turbines to function at capacity." "WASHINGTON — The Nuclear Regulatory Commission unanimously approved a radical new reactor design on Thursday, clearing away a major obstacle for two utilities to begin construction on projects in South Carolina and Georgia. The decision, a milestone in the much-delayed revival of plant construction sought by the nuclear industry, involves the Westinghouse AP1000, a 1,154-megawatt reactor with a so-called advanced passive design." "While many Ontarians are concerned about the state of the province’s finances, discussing the affordability of a pricey program like full-day kindergarten is politically taboo. As the mother of a four-year-old who just started kindergarten, I understand the appeal of “free” care. But Ontario is like the divorcee who can’t stop maxing out his credit card at Holt’s even though his alimony payments would suggest a trip to Sears. Despite being in the worst fiscal straits of all the provinces, Ontario is embarking on the most ambitious early-learning program in the country, introducing not one but two years of full-day kindergarten for four- and five-year-olds. It also went for the gold-plated plan – using teachers instead of early childhood educators for half the day as originally envisioned. Additional cost: $500-million a year." Over the past 7 days (December 7-13), the BPA (US Pacific Northwest) is reporting a combined capacity factor of about 1.37% for it's 3,522 MW of wind capacity. 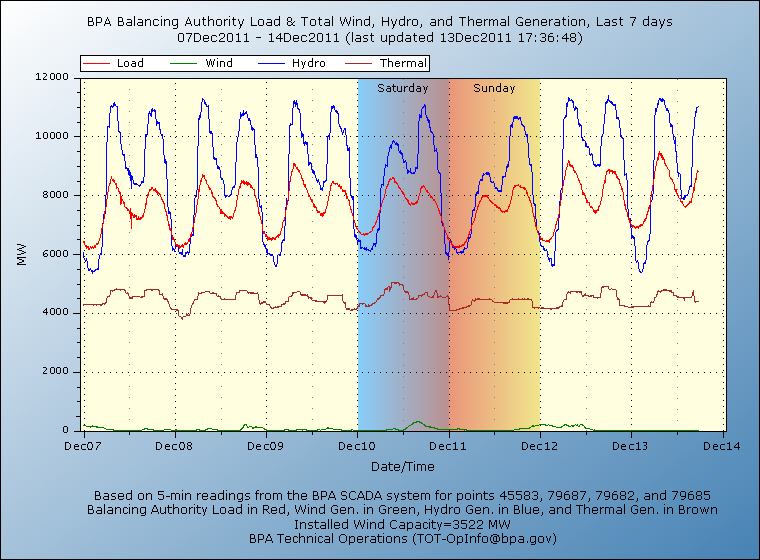 The high over that time is 328MW (7.31% CF, the low is 0). Spin Room: Electricity Market costs helps Ontario keep revenues down for Families. Electricity Market Benefits Ontarians is the release from the government. These people are delusional - or deceptive - or maybe dyslexic. Some updated graphics for 12-month running averages. Hydro One offered a video similar to this months ago - which disappeared at some point, probably during the election campaign. Regardless, here's another informative one. Over 75% of all applicants are in Hydro One's rural service area. 2 acres, 2 SUV's and 2 trackers, each containing 5000 Watts of solar panels. Do urban voters know this is what they voted for? I had a comment to offer Mr. Adams and Bruce Sharp, who has previously commented- but it needed graphics. 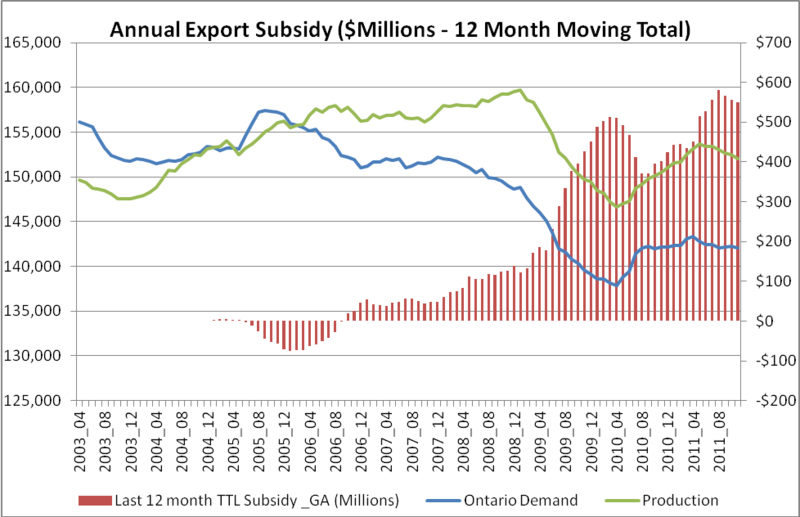 I don't I like the question: "Is Ontario Losing Money Exporting Its Extra Electricity"
It is easy to say that Ontarians would pay about $550 million a year for the same wattage export customers are getting (because we pay the Global Adjustment and they do not). Tom says "without exports consumers would be much worse off," and perhaps that is true. 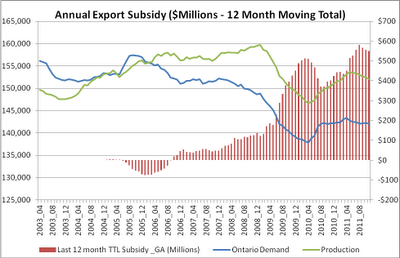 But the bulk of net exports (and I'll use that instead of exports because we do frequently import from Quebec as we export into Michigan - and other places) aren't driven by excess baseload. Much of it occurs during the day. Overcome on the way to energy policy, Germany has still many hurdles. One of them may soon emerge on the German-Polish border: A map of Poland, green electricity from Germany to regulate more, alarmed, according to a report obtained by SPIEGEL, German energy expert. "When excess wind and solar power can not be discharged abroad, then the German power grid unstable," warns the head of the German Energy Agency (Dena), Stephan Kohler. The background is that the Polish network operator PSE Operator is planning to build on the value of current locks.This is to prevent the Federal Republic of forwards excess eco-electricity. The operators of Polish coal-fired powerplants must in such cases the plants shut down suddenly to avoid an overload. In Warsaw, one worries that theongoing high-power stations and shutdown are not up to it and by an unexpected surplus of energy could even lead to a blackout.Therefore, in future, so-called phase-shift interrupt the current flow between the two countries. Surplus energy would then be distributed in the German network, which would increase this side of the border, the risk of blackouts. Dena Head Kohler is now demanding an accelerated expansion of power lines from eastern to southern Germany. "The federal government also needs to quickly get in touch with Poland and other neighboring countries,negotiations to the European energy policy to vote," said Kohler. Earlier this year Poland invited Germany to comment on Polish nuclear plans. Perhaps they already received a response - and disliked it. Similar stories exist in other jurisdictions, the logical outcome when governments are allowed to run free with uneconomic green policies that are aimed at overthrowing basic economic realities. The massive spending and arbitrary policy-making become central planning run amok, an abuse of power and a neglect of sound policy. Contrast this with the lack of coverage in the Globe and Mail, where Queen's Park 'columnist' Adam Radwanski tweeted : "Quick take on the auditor's report: not too much new on green energy..."
"Renewable energy sounds so much more natural and believable than a perpetual-motion machine, but there's one big problem: Unless you're planning to live without electricity and motorized transportation, you need more than just wind, water, sunlight, and plants for energy. You need raw materials, real estate, and other things that will run out one day. You need stuff that has to be mined, drilled, transported, and bulldozed -- not simply harvested or farmed. You need non-renewable resources ..."